Barbara Allen, Aesthetic Realism Foundation Faculty. BARBARA ALLEN graduated from the University of Illinois, Champaign-Urbana. She taught English and Social Studies in the Chicago public schools, and later taught English at Roosevelt Junior High School in West Orange, New Jersey. Ms. Allen began her study of Aesthetic Realism with its founder Eli Siegel in 1970. She is an Aesthetic Realism Consultant, and with her colleagues conducts the monthly “Understanding Marriage!” class at the Foundation. 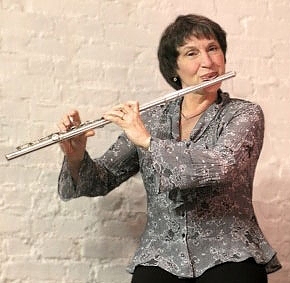 She’s musical director of the Aesthetic Realism Theatre Company and performs with the company as flutist and flute soloist. Ms. Allen teaches the Aesthetic Realism and Education Workshop for Teachers, the “Learning to Like the World” classes for children (ages 5-12), and “The Opposites in Music Class.” She and her colleague Robert Murphy have taught in after-school programs throughout New York City, including Harlem and the South Bronx. Born in Muskogee, Oklahoma, she spent most of her growing up years in Elmhurst, Illinois, west of Chicago. She moved to New York City after a year in Europe. She is married to anthropologist Arnold Perey. Ms. Allen has presented many seminars on marriage, including, “Can Marriage Succeed in a Failed Economy?”; “How Well Do Husbands and Wives Listen to Each Other?”; “Possessiveness in Marriage—Is It Love or Something Else?”; “What Are Wives Really Desperate For?” and more. “Mozart’s Flute Concerto in G Shows the Victory of Self-Questioning”.